“Uh, it’s just up that-a-way. “All nighter” is a movie that isn’t really bad, but at the same time it’s not good either. There are times that I’m lying in my lazy sofa in the weekends, carelessly zapping all channels on my television to see if there’s something on it. And then I come across an unknown movie with a famous person playing in it. And after a while I realize that it’s not much of a movie anyway. But because I’m too lazy to search for another channel, I watch the movie until the end and finally go to bed without realizing what it was about anyway. Well, “All nighter” is that kind of movie. The moment J.K. Simmons appeared on the screen, I had a cheer moment and I thought it might be a good movie. Twenty minutes later, I realized J.K. Simmons wasn’t playing such a fascinating role as in “Whiplash“. He still looks rather strict and discipline-demanding because of his specific looks and bald head. These characteristics were suitable while playing the role of Mr. Gallo, father of a lovely girl called Ginnie (Analeigh Tipton) who’s dating Martin (Emile Hirsch), a banjo-playing vegetarian loser. Already during their first meeting at the dinner table, Mr. Gallo consciously or unconsciously looked contemptuously at Martin. When he knocks on Martin’s frontdoor 6 months later to ask where his daughter is hanging out, Martin appears to know nothing about her whereabouts (they aren’t a couple anymore, it seems). And this is the beginning of a nightly journey along places where Ginnie was spotted the last time. Anybody ever heard of the word cliché? Well, if the word cliché hadn’t been invented yet, it surely would have happened now. Actually all aspects that appear in this movie have already been used elsewhere. Two totally different persons, each of whom have chosen a different path in their life, are forced to tolerate each other’s company a complete night. Obviously, as the night progresses, the two start to have more and more respect for each other. Intense life stories are exchanged. They accidently discover common interests. And before you know it, all prejudices are set aside and they become friends for life. Emile Hirsch (who did an excellent job in “Just Jim” in my opinion) is such a typical alternativo who doesn’t aim for a well-paid job to build a carefree future. No, he rather spends his days pickin’ his banjo. To Frank’s horror Martin is also a vegetarian, he’s allergic to a lot of things and he’s a klutz. Probably his daughter drew the same conclusion and exchanged him for a seemingly wealthy yuppie with whom she goes to Bora-Bora. Perhaps this would-be comedy might be more interesting if Frank and Martin met some fascinating people on their nightly journey. Unfortunately, most characters are extremely annoying individuals. Jimothy (Jon Daly) the junkie who only wears his underpants and a bathrobe while being stoned all the time. Roberta (Christian Scale) and Gary (Taran Kilam), the bickering couple, with Gary showing a rather unhealthy interest for Ginnie. Trevor (Jon Bass) is an arrogant guy who deserved a smack in the face. And then there were a few more supporting roles. The only function they had was to show Frank and Martin the way. It could have been an enjoyable comedy. 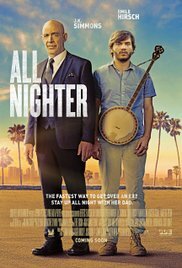 “All nighter” could have been an enjoyable comedy, provided there would be some humor in it. And that’s what’s missing. There was nothing worth a chuckle or a modest smile. It felt forced and corny. Even Gary’s consumption of a large quantity of hallucination-producing mushrooms and his behavior afterwards, wasn’t funny. Deep inside, I hoped he would choke in it. And so they move from one place to another where Ginnie no longer comes or works. Frank acts reserved with the heart-broken Martin in tow. And eventually, the reason for Ginnie’s absence is quite ordinary and everything works out just fine. I thought “Meet the fockers” (also a future-son-in-law-meets-future-father-in-law disaster scenario) was painful to watch. But this one isn’t inferior to the latter. Luckily it was a short pain this time, because this negligible movie lasted only 80 minutes.